Livonia Lights is an award-winning display that has been featured in the Detroit Free Press, About.com, Channel 4, Channel 7, WWJ and other media outlets throughout Southeast Michigan. It is made possible by the effort of 20+ volunteers and the generous support of our neighbors, friends & family. Our songs, “Reflections of Earth” , the “House on Christmas Street”, “Miraculum”, “Happy Birthday Jesus”, “Christmas Eve Sarajevo” and “Silent Night” were carefully chosen to depict the true meaning of Christmas. We also have a lighted cross 30′ above the ground, a “Happy Birthday Jesus” sign, a shooting star and a manger scene for added emphasis. While many Christmas light displays focus on Santa Claus, our display focuses on the true meaning of Christmas – the gift of God’s incredible love through the birth of Jesus Christ in a humble manger. Through dedicating our lives to Christ, our team of volunteers has experienced the profound impact of God’s incredible love. Our hope is that this display will inspire other Christians to be more bold in their faith and spark conversations about Christ. Those of us who follow Jesus celebrate an eternal hope long after our bodies have outlived their usefulness on this earth. If you would like to learn more about the gift of Jesus, visit www.twowaystolive.com. Here is a man who was born in an obscure village, … He worked in a carpenter shop until He was thirty, and then for three years He traveled and preached. He never wrote a book. He never held an office. He never owned a home. He never had a family. He never went to college. He never put His foot inside a big city. He never traveled two hundred miles from the place where He was born. He never did one of the things that usually accompany greatness. He had no credentials but Himself. He had nothing to do with this world except the naked power of His Divine manhood. While still a young man, the tide of popular opinion turned against Him. He was turned over to His enemies. He went through the mockery of a trial. He was nailed to a Cross between two thieves. His executioners gambled for the only piece of property He had on earth while He was dying—and that was His coat. When He was dead He was taken down and laid in a borrowed grave through the pity of a friend. Such was His human life — He rises from the dead. Nineteen wide centuries have come and gone and today He is arguably the most important and influential person in history. …All the armies that ever marched, and all the navies that ever were built, and all the parliaments that ever sat, and all the kings that ever reigned, put together, have not affected the life of man upon this earth as powerfully as has that One Solitary Life. If you would like to learn more about the greatest gift you could ever receive this Christmas, visit www.twowaystolive.com. 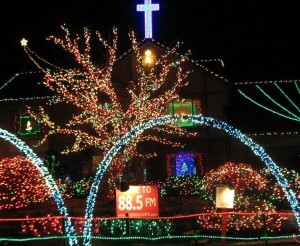 We are visiting from Rochester Minnesota and think this is the most inspiring light display we have ever seen. God bless you and your family. Help setup. We’re always in need of helpers to setup the light display. Contact us if interested.